If you recall from a past blog post, Muni is supposed to start the all-door boarding program on July 1, 2012. It's now official. Hours ago, the SFMTA announced starting Sunday, July 1, 2012 all passengers can board ANY door of ALL Muni vehicles and lines. Statistically, Muni will be the first agency in the nation to implement all-door boarding for its entire fleet and routes. The goal is to speed up the boarding process so buses can keep moving on our streets. Muni will have to invest an extra $900K in salary and benefits to hire ten more fare inspectors. The extra cost will be offset by an estimated $200K in tickets written to violators and other cost savings. This is exactly like the Proof of Payment system already in place on the Muni metro and the rear door boarding procedures remains the same for the rest of the Muni fleet. 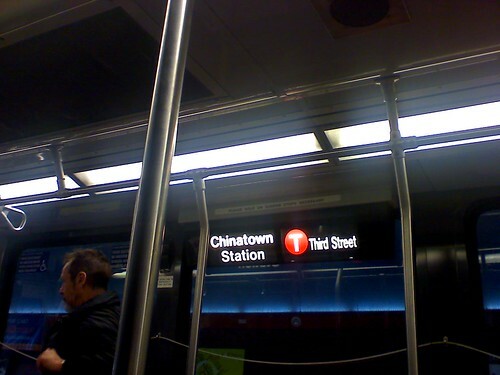 This has been unofficially and illegally done on non-metro lines such as the lines going through Chinatown for many years, but has proven itself to board buses faster than through the traditional method of front door only. Passengers with a Clipper card, metro ticket (Limited Use Ticket/LUT), paper transfer, paper pass, visitor Muni Passport, and other pre-paid Muni media can board any door. Those using a Clipper card or LUT must tag their card at the card reader inside the vehicle. Those non-Clipper media can simply board and take a seat. Passengers paying with cash, youth fare coupon books, and those needing the wheelchair lift or bus kneeling feature must board the front door of the bus. Cash fares to the farebox, Clipper cards uses the reader, and youth coupons handed to the driver. 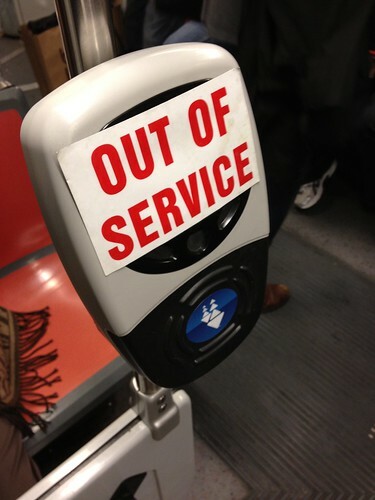 All Muni lines are now using the honor system known as "Proof of Payment." You must have a valid pass or fare receipt at all times. Expired passes and fare receipts/transfers are invalid and a violation of city law. It is necessary to have unexpired media at hand at all times. Passengers are subject to inspection by an officer of the peace or transit fare inspector. Anyone using a Clipper card or a Muni metro Limited Use Ticket (LUT) must ALWAYS tag their card/ticket on a Clipper card reader, regardless if you have a valid monthly pass or know your electronic transfer has not yet expired. If you have a current monthly pass and didn't tag it, the fare inspector will have to hassle with you and check the data on your card using their handheld reader, and that's a waste of time. For more information on why it is important to tag your card, click here. This is a very important topic for all-door boarding. If you are used to the unwritten "commuter rules" for BART, you know the basics for the upcoming July 1st implementation of Muni's all-door boarding. Rule #1: Always let passengers exit the vehicle first. It's a matter of courtesy to let exiting passengers leave the vehicle first, then boarding passengers enter second. Also, exiting passengers should always be ready to exit the vehicle, don't do it late; if it's crowded, be vocal and say you need to exit the bus just BEFORE it arrives at the stop. Rule #2: Don't clothesline passengers. If you have a Clipper card, try your best to board the correct side of the rear door that is closest to the Clipper card reader. If you board the wrong side, don't stick your arm out to tag your Clipper card on the opposite side, you could hurt someone; just wait until everyone else boarded, then tag your card. Rule #3: If you are the only passenger at the stop, just board the front door. It's a waste of time and annoying to a bus driver and fellow passengers if you are the only person at a bus stop and you want to board the rear. Just use the front door. This makes even more practical sense for the less used Muni lines such as the community service routes. Exception: Muni metro lines, just press the door open button. Rule #4: Respect the fare inspectors. Have your fare media available for inspection in an easy to access place. Don't crinkle your transfer up and toss it in your pocket. If you have a Clipper card, I suggest using a clear plastic protective sleeve instead of digging in your pocket for your wallet. Rule #5: Always properly tag your Clipper card. Getting the dreaded "three beeps of death" is not just annoying to hear, but also holds up other passengers behind you trying to board and tag their card. Never swipe the card like a credit card, don't move the card around the sensor, or quickly tap the card and move the card away from the sensor. The proper procedure is: Hold the card steady on the reader until you get the single beep confirmation tone, and then remove the card. Read more for tips on properly tagging your Clipper card. So that's it. Monday, July 2nd will be the first business day for the program. Let's see if it really speeds up service as it promises. On a side note: Strangely, I just finished a blog post hours prior to Muni's big announcement; I was questioning why there was no updates or if it was going to start on July 1st. Then I get the twitter message and had to delete all the material I had ready. UPDATE: BART is back open. Good work BART repair crews! Bad timing for BART today. An early morning fire spread to the tracks near the West Oakland station causing possible damage to the rails or the structure. Due to the fire, BART has completely shut down the transbay tube, no service is being provided between San Francisco and Oakland at this time. BART will run two different systems, a service between SFO/Daly City and Embarcadero, and lines within the East Bay. Read BART's press release. With no transbay tube service, it's already a mess on the roads. There's thousands of people who can't get to the U.S. Open via BART, unless if you are in a hotel in downtown SF, you got extra lucky. Get across the bay via the Bay Bridge or San Mateo Bridge and take 101 to Candlestick Park. Park your car at the stadium's parking lot and take the shuttle buses to the U.S. Open. 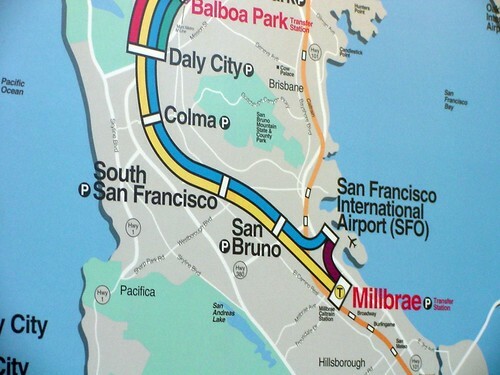 You can also take the San Mateo Bridge and park your car at Millbrae or San Bruno BART, pay the parking fee, and take BART to Colma for the golf shuttles. Take the Oakland/Alameda ferry and walk to Embarcadero BART station. Take BART to Colma station and take the golf shuttle. Take one of the AC Transit transbay buses, get off at Transbay Terminal and walk to a BART station. Take BART to Colma station for the golf shuttle. If you don't want to stress it, eat your ticket money and just stay home today. Sorry. For those of you searching for parking, please don't attempt to park near the event area. Parking is extremely limited and in many areas, heavily restricted to time limits, special permits, or heavy security presence blocking entrances to private parking lots (such as the churches on Brotherhood Way). Like I said earlier, your best bet is Candlestick Park. UPDATE: Official response from SFMTA here. Read below for original blog entry. Just yesterday, I was at Balboa and 37th Avenue after my medical appointment and noticed something odd on the southwest corner of the block. In front of the bank and pizza place was this odd looking closed circuit camera up about 20-30 feet above the street. If you are thinking it was attached to a lamppost or electrical pole, it wasn't. The two domed cameras was attached to a long metal pole about 20-30 feet long, and the pole was attached to a trailer hitch generator. If you don't know what a trailer hitch generator is, it's the ones construction crews use to power jackhammers to bust-up pavement, and the big saws that cuts through the pavement. Strangely, these portable camera systems did not have any markings indicating it was owned by the city government, SFMTA, or the police. The generator was painted red and had a sign on the meter saying it was a designated temporary tow-away zone (the same signs you find at street fairs and marathon routes). I also found the same camera device on Sunday on West Portal Avenue about a half block away from the metro station. Earlier this morning, I thought I'd give my local police station, the SFPD Richmond station a call to find out what's going on. I explained to the person on the phone basically everything you are reading above, and he had no clue about what it was or where to refer me to. I was thinking it was related to the recent news stories about Muni's plans to put new behavior detection cameras along the metro system, but 37th and Balboa is not along a metro line, it's just a small business district. But having a hunch it may have been Muni's idea (since they enforce parking and put tow away signs), I e-mailed Paul Rose of the SFMTA for information. As of right now, he's checking on it, but I haven't received any further information. Does anyone know about this? Leave a comment. UPDATE: After the Giants game, I went to the camera location to take some photos of it. You'll notice the slideshow on the top of the blog entry. I took a good look at everything and the sign on the meter says it is for the SFMTA's parking program as some kind of survey tool. But it's still odd there's just a little sign saying that, and nothing posted on the generator saying what the purpose is. Some may assume it's there to watch over crime for the cops, others may say it's an invasion of privacy by looking through a neighbor's window. Whatever it is, it still feels kinda creepy to me. However, I have not received any official info from the SFMTA about this project. If you recall back in late August 2011, I mentioned about a Muni operator on the 18-46th Avenue line that continued to treat passengers poorly. In one incident, he pulled over to the front end of a very long bus stop at La Playa and Cabrillo instead of the middle of the stop where the bus shelter is located; but with no passengers requesting to exit the bus, he sped off while I noticed passengers in the shelter grabbing their groceries and starting to move towards the bus. So did the driver learn his lesson all these months? Nope. Just yesterday, I just finished my medical appointment and went down to my local Safeway at LaPlaya and Cabrillo (also known as "Safeway by the Beach") to pick-up something for dinner. When I walked back to my car, I heard the familiar sound of the 18-46th Avenue inbound bus to Legion of Honor come by. When I took a look at who was driving, I noticed the familiar cap the driver of the previous incident wore. Thinking he might pull that unfriendly trick on passengers again, I quickly pulled out my iPhone and started recording video. You can view the video at the top of this blog entry. The short video you watched shows the same driver pulling all the way in front of the bus stop, instead of stopping near the cluster of passengers waiting next to the bus shelter. The 'regular' size Muni buses are 40 feet long, and the back end of the bus was as the front end of the shelter, so I'd estimate the driver pulled 40 feet too far forward (as usual) to discharge and pick-up passengers. I personally feel this is totally rude and disrespectful. He knows the shelter is where all the passengers wait for the buses and nearly all the other drivers stops in front of the shelter, but decides to go all technical and pull to the far forward end of the bus stop. I'm also concerned about the elderly passengers. I normally notice many older passengers riding the 18 from that particular stop, and forcing them to haul Safeway groceries an additional 40 feet while worrying if the driver is going to close the doors and drive off is not a great feeling. Lastly, wouldn't you think the incident back in August I blogged about and calling it in to 311 solved anything or disciplined the operator for being discourteous? It seems like he hasn't learned his lesson. Perhaps this blog entry doing some public shaming will teach him a lesson. Ever ride Muni metro going outbound and notice the sign on the train says "West Portal?" This typically happens when the metro is trying to recover from a delay or providing additional service for a ballgame at AT&T Park or a major event in downtown. In order for Muni trains to turn-around, they use the switchback down at St. Francis Circle. Muni used to do this at the L-Taraval track turn-off at West Portal Station in front of the library, but that sometimes holds up train traffic. What I normally do when I want to visit downtown is I park near St. Francis Circle because there's always available parking and no meters. 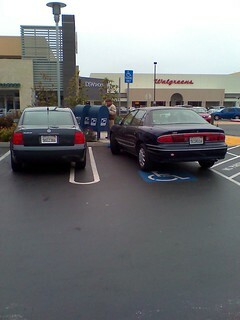 It also helps me get access to my car on the way back so I can go grocery shopping or get dinner. The reason why I'm blogging about this is to ask Muni why the metro signs say "West Portal" when the true destination of the train is actually St. Francis Circle? I encountered a problem on Sunday when I boarded train 1478, an outbound shuttle train stating "West Portal." When the train reached West Portal, I kindly asked the driver if she's continuing onto St. Francis Circle. Usually, operators will allow passengers to stay on for the short ride the next two stops (14th/West Portal and St. Francis Circle), but when I asked the driver if it's going to St. Francis Circle, she said "NO" and pointed her finger towards the door to tell me to catch the next train. I told the driver of 1478 that my car is parked there and that since the train is being turned around at that point, if I could stay aboard. She said to me: "You work for Muni?" I said: "no I did not" and I was booted off the train with another fellow passenger getting off at the same stop. In fact, two other passengers sitting down and in plain sight of the driver's mirror wasn't asked to leave the train, only me and the other passenger who was bold enough to ask the driver. The fellow passenger and I waited for the next train, luckily it was a K-Ingleside train, and we were following train 1478 towards St. Francis Circle. Instead of taking 1478, the K-Ingleside train had to wait for five minutes for the 1478 to clear out of the way so we could advance to the stop and be let off. So... what's Muni's official policy regarding trains bound for "West Portal?" Is operators required to continue to haul passengers to St. Francis Circle? Or why isn't Muni operators programming the signs to actually say "St. Francis Circle?" The history of the Clipper card program (formerly known as TransLink) has always permitted card users to allow their card to go into the negative if there's at least $0.01 [positive] credit on the card; but once it goes into the negative, the card cannot be further used until replenished with money back to positive balance. The idea behind the negative balance policy is both a honor approach for people to promise to keep their cards and replenish when negative, but also for agencies that operates on a distance based or zone system: Clipper cannot accurately charge the proper fare upon the initial tag when boarding a bus (Golden Gate Transit) or at a train station (BART and Caltrain); therefore the negative balance policy will have to remain indefinitely. However, back in November 2010, the can of worms that has been kept stable for nearly a decade suddenly exploded when Streetsblog SF, and other major news stations exposed the negative balance policy. It suddenly changed from a policy with good intentions, to an easy way for passengers to cheat transit agencies of transit fares with literally no risk of getting caught. The way to do it was simple, purchase a new Clipper card with the required minimum balance and use it on a transit agency where the fare was higher than the balance placed on the card. Back in 2010, all a person had to spend was $2 to get a new card and a $2 e-cash balance, and the passenger simply rode any transit agency whose fare was more than $2. After ending the ride, simply dump the card in a trash can and go through the cycle again. It was easily untraceable if passengers paid in cash for a card and did not register the card with Clipper. MTC and Clipper fought back, by raising the minimum e-cash balance to obtain a card to $5, but did not enforce a policy to pay an additional fee to obtain a new card, but even with $5, there are still a bunch zone/distance rides that costs more than $5 one-way, such as taking the BART train to SFO. In the long run, the negative balances started adding up into the six figures per year, and that does not include the cost per card to replace the ones dumped in the trash. Back in September 2011, I reported the negative balance feature on Clipper cards was being abused at a rate of $360,000 per year in lost transit fares, and when including all the costs of procuring cards, the MTC spends a grand total of nearly $700,000 per year. The MTC is planning to spend some money in order to plug up one agency that has racked-up 60% of all negative balances, and that's BART. This Friday, the Operations Committee will have a meeting to vote if the commission should spend $625,000 to end the negative balance problem for BART. How? 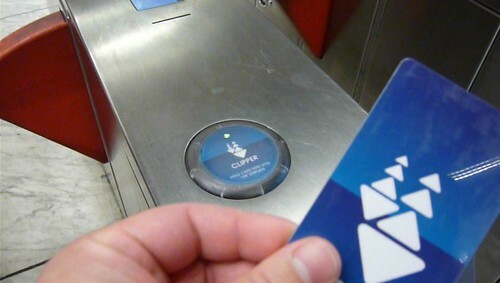 Simple, the contractor (Cubic Transportation Systems) will be paid to upgrade all the exitfare machines in the BART system to force passengers with insufficient funds to add more money to their Clipper card before being allowed to exit. It's just like the old school magnetic stripe tickets so people don't pay the minimum fare to obtain a ticket, and exit at a station for a ride costing $10. By doing this, the MTC will save an estimated $216,000 per year in negative balances (or $420,000 per year if you include cost of procuring new cards). Even though the contract to upgrade the exitfare machines is over $600,000, in the long run, the investment will pay off in a matter of a few years. While this still does not plug-up the holes with the remaining 40% of other transit agencies still taking negative balance abuse, at least plugging up the worst offender (BART) is a step in the right direction. Another feature of upgrading the exitfare machines? As the MTC is planning to allow the exitfare machines to accept Clipper cards, this could also be the next step for passengers who utilizes paid BART parking lots to also use their card to pay for their parking fees. Instead of a mirror hang tag (that is used today), it would be the same as using a BART mag stripe ticket to insert into a exitfare machine to punch in the parking stall number to pay their parking.